Week 5 Results of Hi Ho Books Away! Return with me now to the not so thrilling day of this morning. Before you ask - yes that is THE bench in the picture. And yes it took nearly an hour and a half. I mean I have other things to do you know. Tonto keeps complaining that I'm neglecting my other duties. Anyway, this is a narked off Lone Ranger today. So I suppose you want the low down? Within 17 minutes a man and a bin man discuss the book whilst looking at it. At 50 minutes two girls sit next to it and light up. 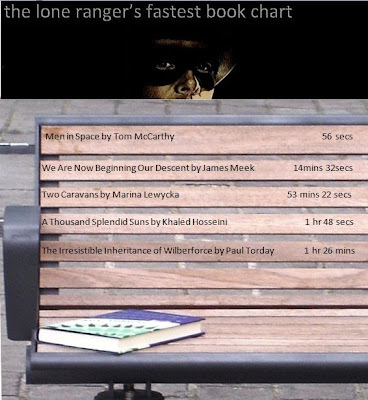 At 1 hour 10 mins two strangers sit with the book between them - some conversation about the book, a hand up to say no and the book rests on the bench again. Finally at 1 hour 26 minutes an old couple pick it straight up and walk off with it. And for this I trained at Law school. 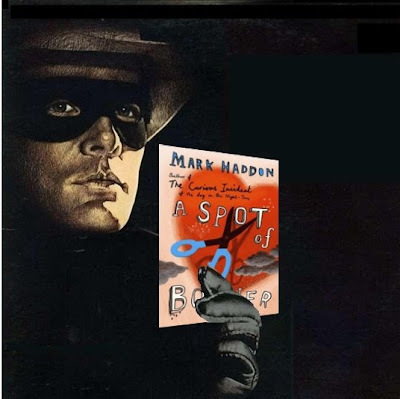 Next week: A Spot of Bother by Mark Haddon - if I can be bothered. For lasts weeks account click here. Hilarious...It's got to be the old couple. I imagine that's what I'll be doing when I'm out of work: searching park benches for something to read. I fail to see why you find my bad day hilarious Rufus. What is Rufus? An Indian name? What does it mean? Steady LR - sorry Rufus he's a bit cranky at the moment. I wonder if it's pure chance who happens to pass the bench, or whether the covers and titles play a role? Mind you, if passers-by are familiar with what's current, they should be popular. Many of these titles were in the front window display of my home-town book store last month. And 'a Spot of Bother' is my upcoming read for my Book Club. I hope it proves easy for you LR! Rufus means 'red' in Latin, kemo sabe. Sorry to be insensitive about your bad day. Sometime I speak rashly. It's my fiery humor. Amateur: a great business idea if you don't care about making money. The elderly are great readers but stingy with their purses. "Many of these titles were in the front window display of my home-town book store last month." I made a decision not to go for my old books that I just wanted to get rid of and instead we've gone for literary hardback novels that are fairly well known. At the moment we are in talks with someone else in the industry as to what we can do with the top 10 once we've finished. Good day Red I like that your fiery humour goes with your name. I am back to my normal self! Good cheer my friends, I ride again! Hi Ho Hi Ho it's of to work we go. er .. or is that to do with dwarfs? Lone Ranger, I looked it up and by legend you and Tonto are famous as was typical among hard-working men in the Old West for being--laconic. You never say anything more than, "Hi Ho Silver," and head into the sunset. The rest of us, however, have been slacking. Our job--and it's an important one--is to say in clear wonderment, "Who was that masked man?" "Who was the masked man?"